Tomato Rasam: Tomato Rasam or Chaaru or Saaru or Kabir is a South Indian traditional soup, traditionally prepared using tamarind juice as a base, with the addition of tomato, chili pepper, pepper, cumin and other spices as seasonings. Steamed lentils are also added along with any preferred vegetables. It is eaten with rice or separately as a spicy soup. Dry roast whole black pepper and cumin seeds. Let the dry roast cool down to the room temperature. Grind pepper and cumin seeds mixture, coarsely, to make rasam powder. Take just enough water to cover the tomatoes in a pan. Boil the tomatoes in water for 3-4 minutes. Switch off the flame and keep it closed for 5 minutes. After 5 minutes, remove the skin and mash the tomatoes well. Add in the ground rasam powder, few curry leaves, salt and let it boil for about 5 minutes. Add in 1 1/2 cups of water. Switch off the flame once froth starts forming at the top of the boiling rasam. Heat a tsp of ghee in a frying pan. Temper the mustard seeds, red dried chillies and curry leaves in the ghee. Pour the ghee, tempered mustard seeds, red dried chillies and curry leaves mixture over the rasam mixture. Garnish the tomato rasam with finely chopped coriander leaves. 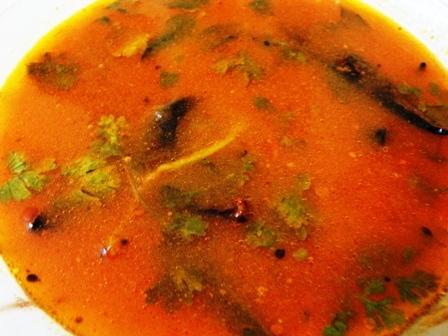 Serve hot tomato rasam with steamed rice. Always boil rasam in low flame. Switch off, once rasam becomes frothy at the top.Do not boil after that as it will not taste good. Adding curry leaves and coriander leaves makes it more flavorful. Seasoning is the key for a good rasam. You can powder equal quantities of black pepper and cumin seeds in advance and store it in an airtight container. Use 1 tbsp (flat) of that powder to prepare this rasam. You can add 2-3 crushed garlic for more flavor along with the rasam powder if preferred.